Whether you have had your tree chopped down as part of a gardening venture, following violent storm damage or because of disorders, if the tree surgeons who chopped down your tree didn’t provide tree stump removal then taking out the left over tree stump is not a straightforward job. Our professionals work, not only with individual business and home owners but they also work with professional landscapers, local councils and property developers. No project is too tough for our tree stump removal professionals to handle. All of our service providers are responsible when it comes to their managing of each project, no matter how large or small the job is. Nearly all the tree stump removal projects are finished in less than a day except if there are extenuating circumstances beyond our control. What Is The Charge For Stump Grinding? The location of the tree stump to get removed. If a stump is close to a wall, building or fence, specialist equipment is required in addition to more care & skill for the tree expert, so as to reduce the chances of damage to your property. Adjoining tree roots. If the tree roots have spread below a drive or footpath, that causes other complications which entail more equipment and management. What are a couple of the most popular solutions of tree stump removal? 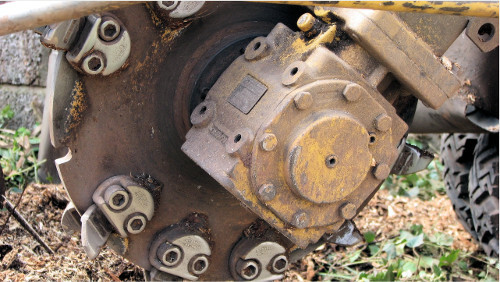 Stumps may be eliminated by extracting, grinding, using chemicals or burning in order to remove them. Which tree stump removal technique does the job the most effective? There is not one procedure which is more ideal than any one of the others. Instead, the appropriate procedure will depend on the scale of the tree stump, its root structure, and numerous different details. How much time does it need to clear away a tree stump? The length of time it takes to take out a stump will depend on the procedure chosen by the arborist. Utilising a mechanical tree stump grinder or a mechanical tree stump remover it may be finished in an afternoon whereas burning or using enzyme treatments will take significantly even longer. Exactly what is the most reliable technique of tree stump removal? The ideal solution is to extract the tree stump by working it loose from the ground and then using a pulley or cable to powerfully lift it directly from its root systems. This method needs large machinery and is not a DIY project. Are your personnel properly insured? Stump removal is dangerous in some circumstances, and that is exactly why it is so critical to locate a company with both the knowledge and experience to complete the project right. It’s also important to mitigate any type of possible danger. Every one of the tree stump removal service providers in our network hires tree surgeons who are completely insured & licensed. Can I Not just burn a tree stump out? Lots of homeowners make the oversight of assuming that they are able to easily use petrol or paraffin to burn the tree stump out. Although this specific solution can and in some cases will work, it really maybe hazardous for those that are not experienced. What is more, in some cases, the tree stump does not fully burn out, which results in an unattractive growth. Will the tree roots be removed, also? Tree root removal is not usually provided in a stump removal service, and in many cases, it is not needed. Once a tree stump has been properly removed, the tree roots will not continue to grow and should certainly cause no issues to your house’s foundation or lawn. Can I perform the tree stump removal on my own? Many residential or commercial property owners think that it should be okay to extract a stump by fastening a rope or strap to it and then trying to yank it out with a van or truck, or by trying to burn it to the point where the rest of the tree stump may be chopped out with an axe. Having said that, neither one of these solutions are endorsed, as significant damage to your home might be created. Is it really going to cost a lot to have the tree stumps taken out on my home? Stumps which are quicker and less complicated to extract will certainly set you back less than those tree stumps which are bigger and much more deeply rooted. When speaking with the tree stump removal contractors, they should give you a quotation, which is going to include complete removal of any tree stumps which may well be present in your garden which have become a hazard and you would like them removed. To learn more about what our tree stump removal Leeds can do for you don’t hesitate to call us today for a free quotation for all your stump removal needs.